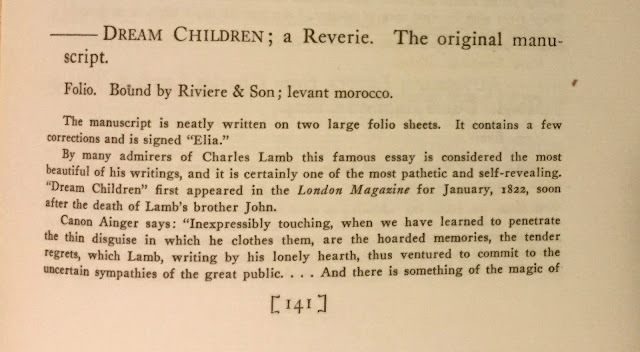 There are many lovers of Charles Lamb who consider "Dream Children; a Reverie" to be his best essay. 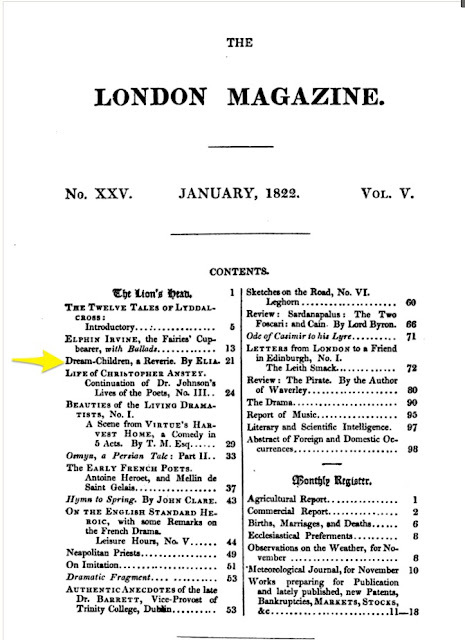 It first appeared in print in the January 1822 issue of The London Magazine. 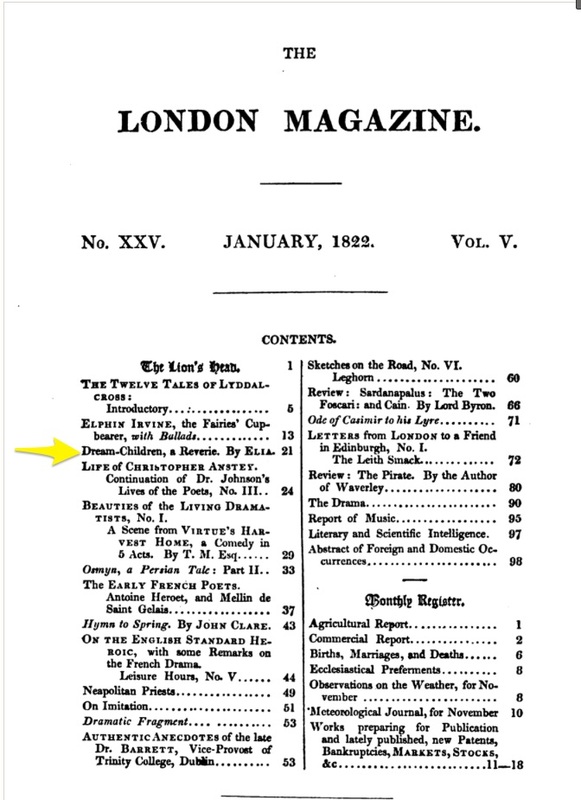 It next appeared in the 1823 first edition of Lamb's Elia essays under the title, Elia. 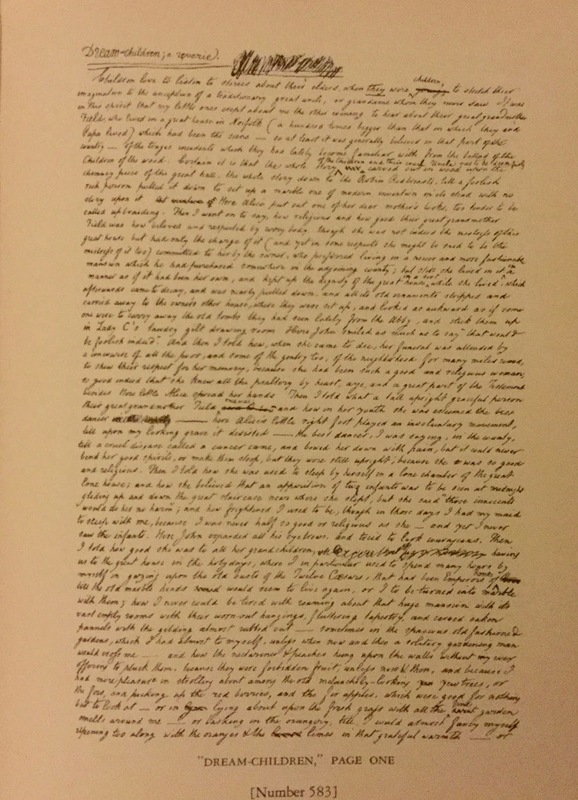 Essays which have Appeared under that Signature in the London Magazine. 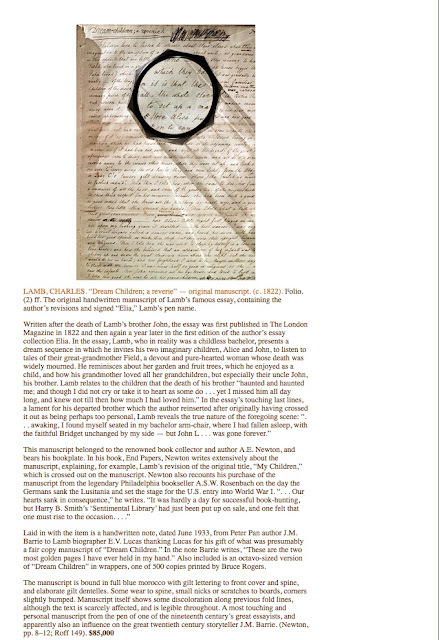 Where the manuscript of "Dream Children" went after Charles Lamb's death is unknown, at least to me. Lamb may have given the manuscript of "Dream Children" away before he died. 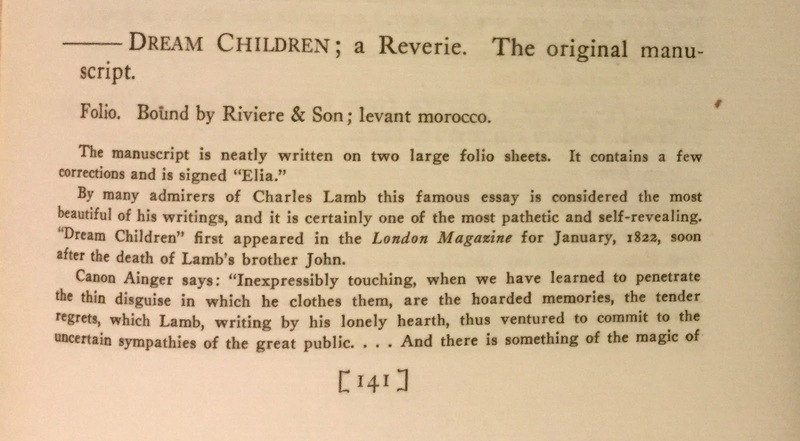 In his book, John Forster: A Literary Life, published in 1983, James A. Davies wrote that Charles Lamb "once sent Forster a collection of Elia manuscripts (25)." But Davies does not identify which manuscripts Lamb sent to Forster. 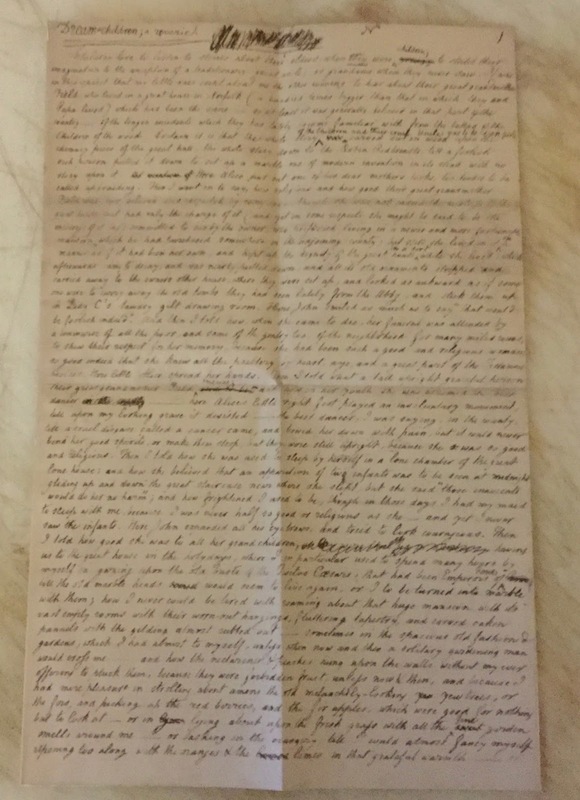 Moreover, Edward Moxon presented at least one other manuscript to Francis John Ford who worked with Lamb at India House. 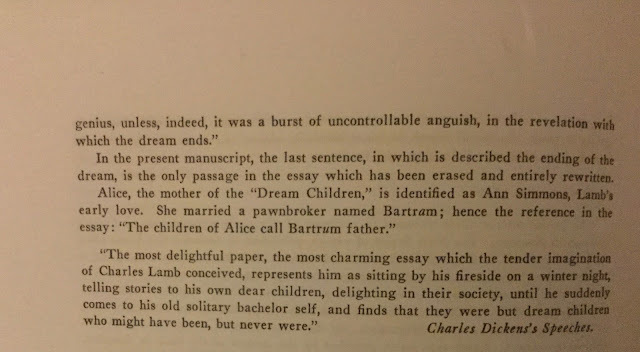 The first record of the history of ownership of the autograph manuscript of "Dream Children" that I could find doesn't appear until 1892. 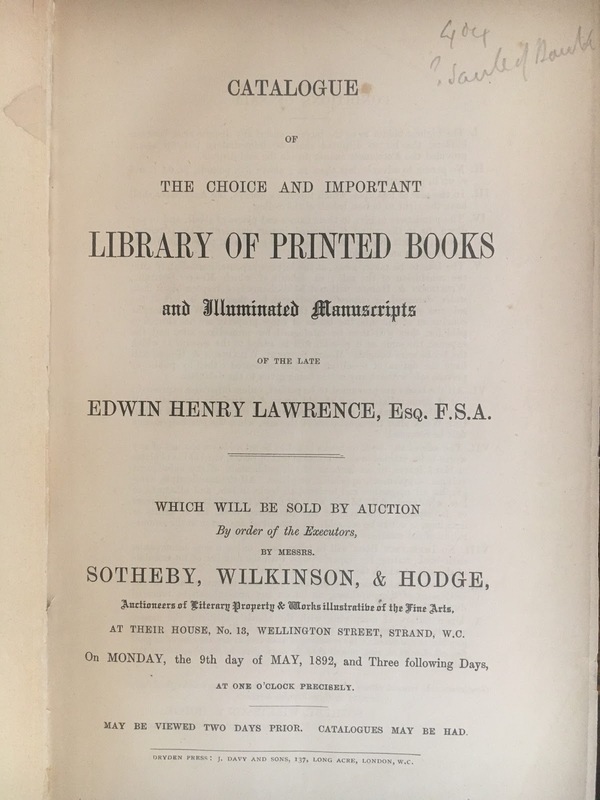 It is listed as Lot number 805 in the Sotheby, Wilkinson & Hodge auction of the library of Edwin Henry Lawrence. 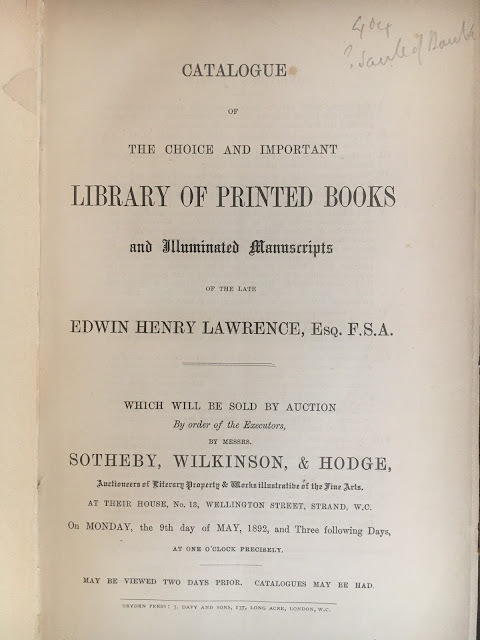 Edwin Henry Lawrence (1819-1891) was a London stockbroker who collected antiquities, autograph letters, and manuscripts. 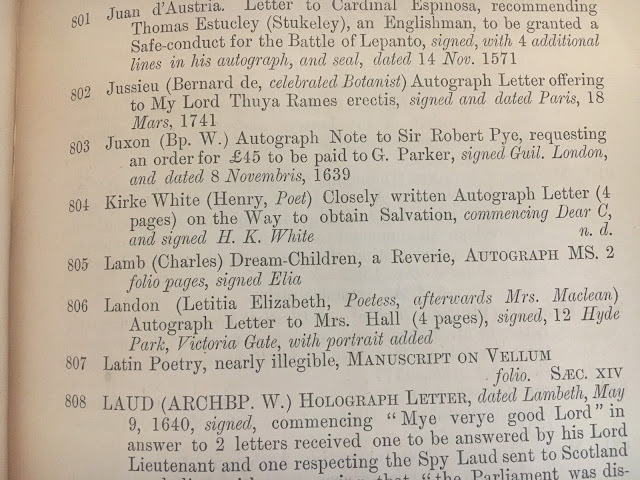 How he acquired the autograph manuscript of "Dream Children" is unclear. He was the great nephew of the Sir Thomas Lawrence, the English portrait painter whom Lamb mentions in his essay "Cupid's Revenge." ...Something of St. James's air in these my new friends. How my prospects shift and brighten! Now if Sir Thomas Lawrence be anywhere in that group his fortune is made for ever. 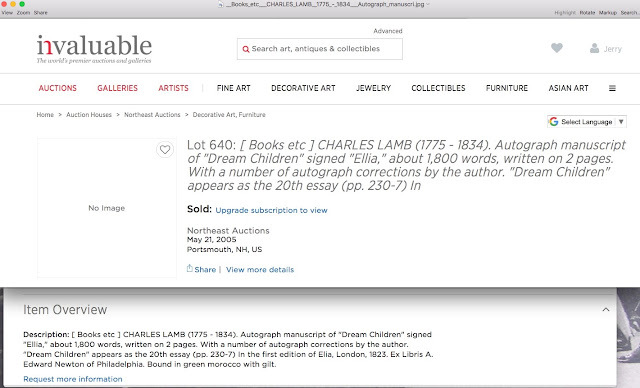 I think I see some one taking out a crayon...."
Stuart M. Samuel (1856-1926), a British banker and a member of Parliament, who bought manuscripts solely for investment purposes,was the buyer of Lot 805, purchasing the autograph manuscript of "Dream Children" for £57. 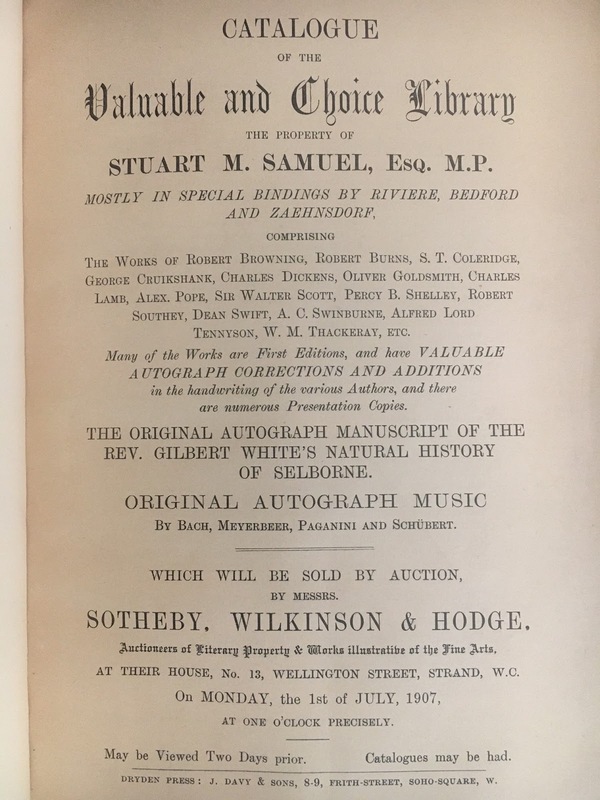 The manuscript was listed as lot number 97 in the sale of his library in 1907. 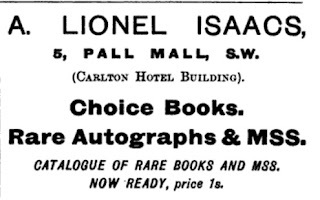 A. Lionel Isaacs, a bookseller from Pall Mall was the purchaser of lot number 97. 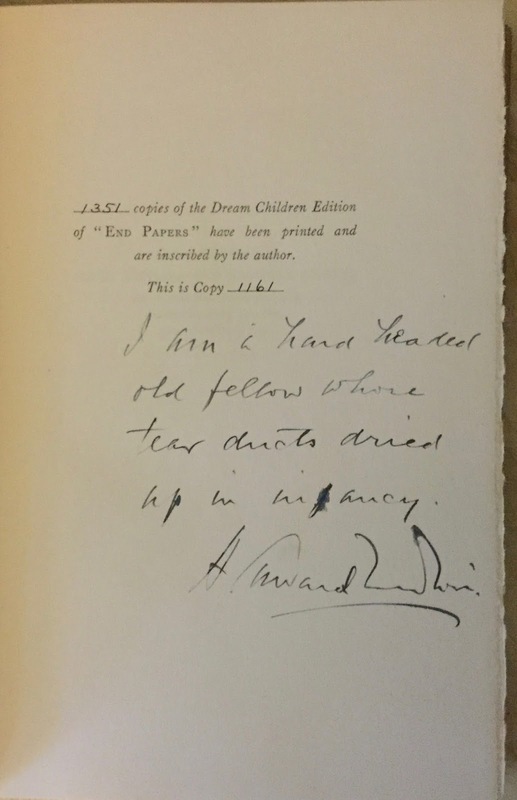 He acquired the autograph manuscript of "Dream Children" for £108. 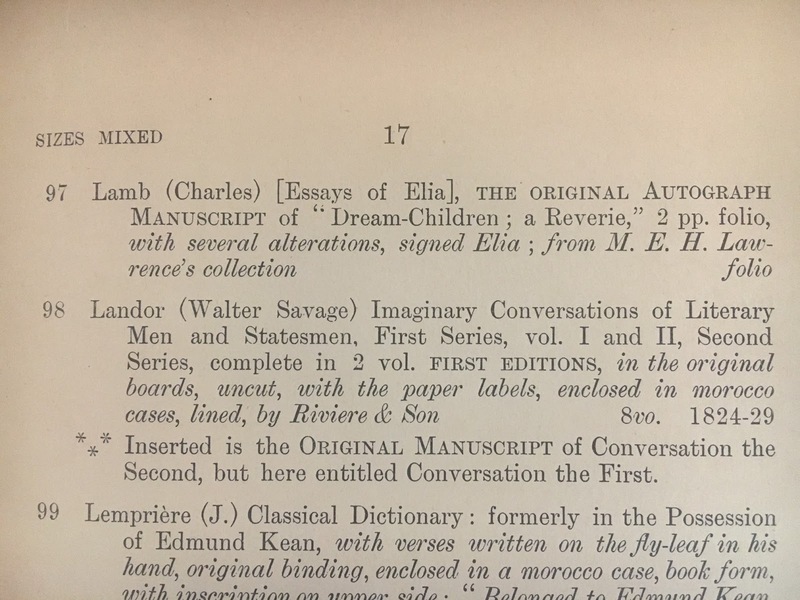 He may have listed the manuscript in the catalogue below in the summer of 1907. 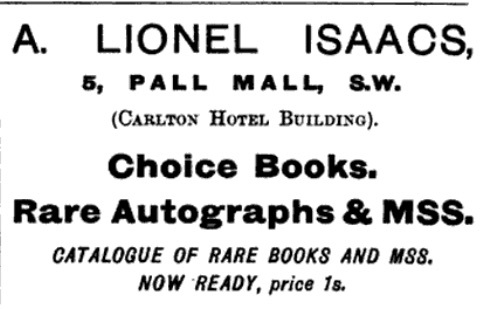 Harry B. Smith may have read the catalogue, or he may have visited Isaacs's bookstore when he went to London in 1909. At any rate, Isaacs sold the autograph manuscript of "Dream Children" to Harry B. Smith for £225. 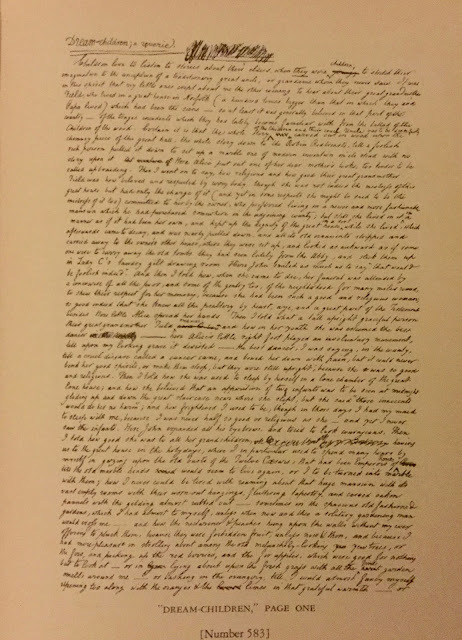 In his book, First Nights and First Editions, Smith revealed that purchasing the autograph manuscript of "Dream Children" was the only time he paid more than a thousand dollars for a book or an autograph. A few years later, the millionaires started buying books at auction. And books that used to cost Smith a few dollars to buy now cost thousands. Believing he could no longer afford to add to his collection, Smith compiled a catalogue of his library and the DeVinne Press privately printed it for him in 1914. 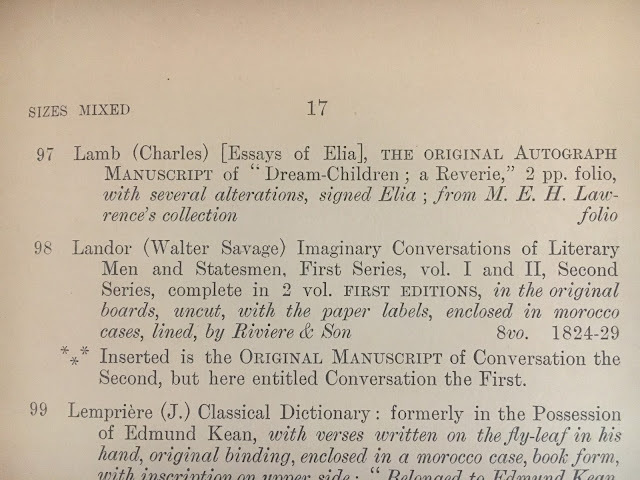 Here is Smith's listing of "Dream Children, the Original Manuscript:"
One of the bibliophiles who praised Smith's catalogue was the bookseller A. S. W. Rosenbach. In their biography of Rosenbach, Edwin Wolf 2nd and John F. Fleming revealed that Rosenbach bought the bulk of Smith's Sentimental Library for $79,000, money which he borrowed from his friend William M Elkins. A. Edward Newton was one of the first bibliophiles to make a considerable purchase of Smith's Sentimental Library. Wolf and Fleming report that he bought ten items for less than $5,000, but they do not identify the titles of the purchases or the date they were purchased. 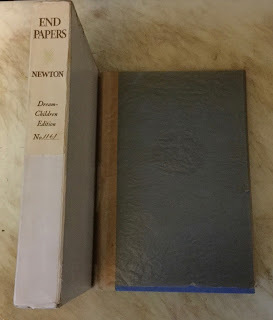 In his book, End Papers, published in 1933, Newton reveals that he bought the autograph manuscript of "Dream Children" on the day the Germans sank the Lusitania (May 7,1915), but he does not say how much he paid for it. 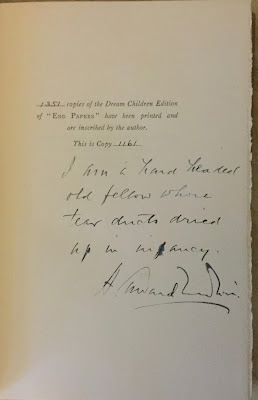 Inserted in a pocket in the rear of the limited edition of End Papers was a facsimile of the autograph manuscript of "Dream Children." 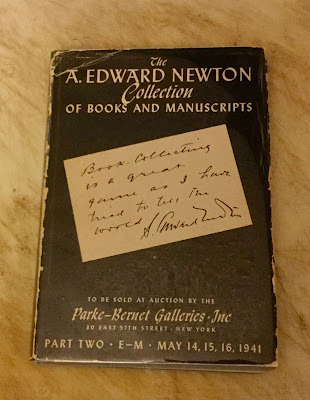 Newton first mentioned his ownership of the manuscript of "Dream Children" in his 1921 book, The Amenities of Book-Collecting, calling the manuscript "my most cherished literary possession (131)." 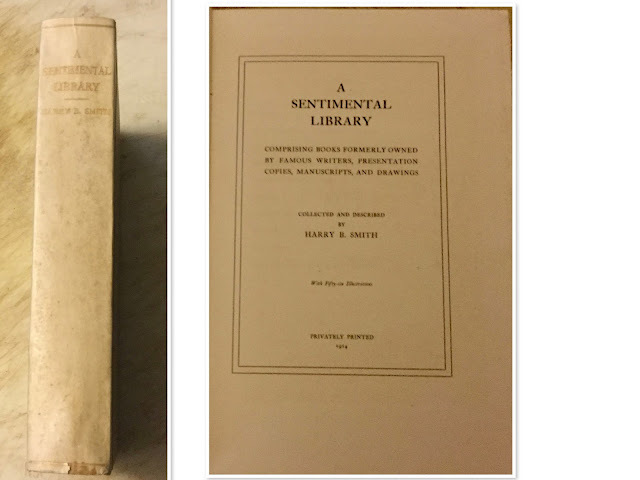 The whole Sentimental Library passed one day into the temporary keeping of Dr. Rosenbach and was placed on sale by him the day the Lusitania sank during the Great War. The fact that we were all scared to death that day prevented my buying as much as I should have done, but some of the most interesting books in my library are 'Sentimental' items (72). ...I do not know who owns it now, but he would probably consider ten thousand dollars a low price for it." To which Newton adds, "He would indeed, Mr. Smith very low (102)." A. Edward Newton passed away on Sep 29, 1940. His son Swift Newton put his father's library up for auction the following year. On Thursday evening, May 15, 1941, the autograph manuscript of "Dream Children," lot number 583, sold for $7500, which was considerably less than what Newton believed the item was worth. 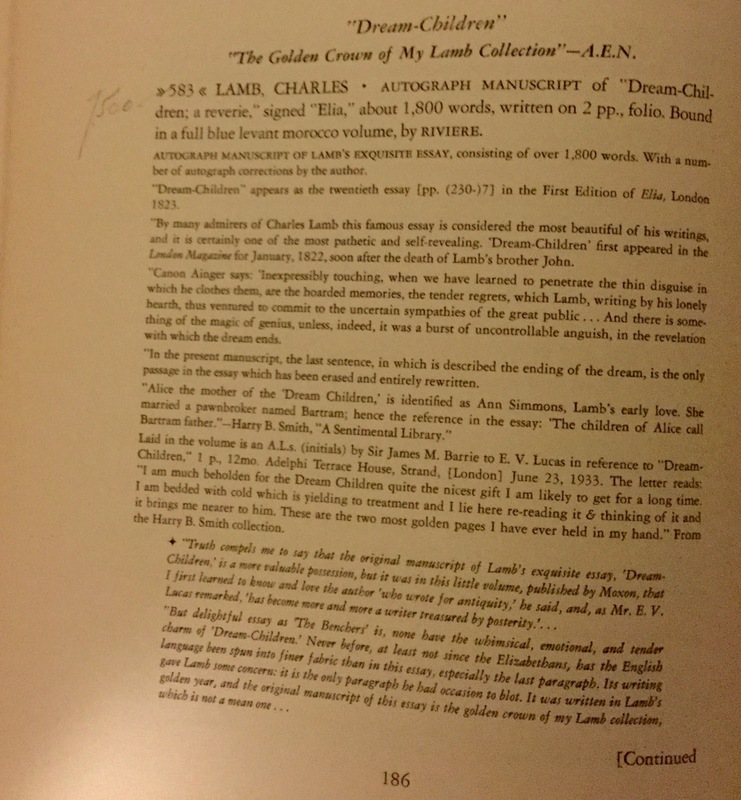 The William Blake collector, Mrs. Landon K. Thorne, was the new owner of the manuscript of "Dream Children". The autograph manuscript next appears at a country auction in Portsmouth, New Hampshire sixty-four years later on Saturday, May 21, 2005. The manuscript may have stayed in the Thorne family until that date. 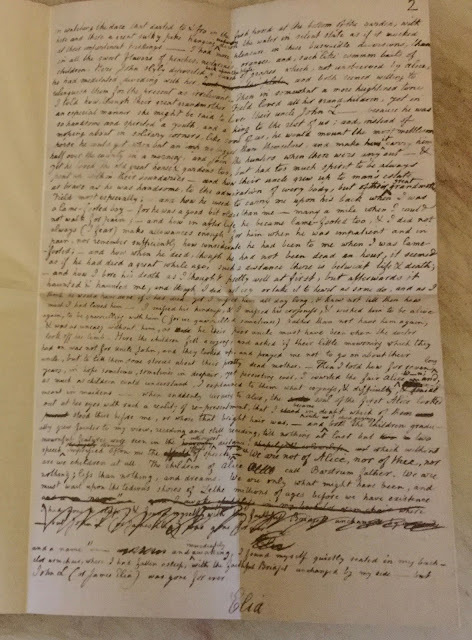 The autograph manuscript of "Dream Children" is currently in the library of a private collector who wishes to remain anonymous..... If it were me, I would tell the world! 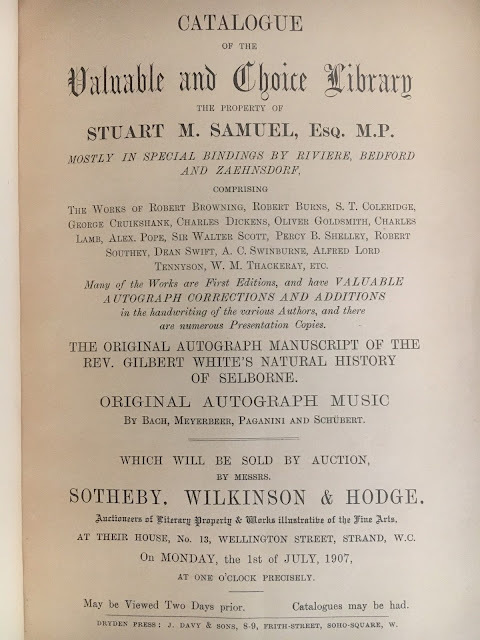 Thanks go to Meghan Constantinou, Librarian, Grolier Club, and Sophia Dahab, Assistant Librarian, Grolier Club for providing the images of the Grolier Club copies of the 1892 and 1907 Sotheby, Wilkinson & Hodge auction catalogues. I wrote a second blog post about Lamb this month: Passages From Lambians in My Library, Large and Small.